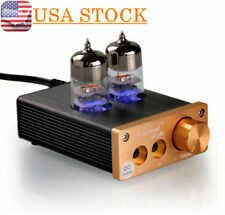 Little Dot MK III HiFi SEPP Vacuum Tube Headphone Amplifier Stereo Audio Preamp. Condition is Used. Open box return. It seems that the original buyer took the power cord and returned the rest of the unit. The audio/video cable and adaptor accessories are still factory sealed and the amp itself is in Excellent Condition. I am listing as “Used”, because it was a return, but I can assure you it looks like it’s never been used. See photos for condition. If you have any questions let me know. Thanks for checking out my listing and please feel free to check out the other items I have available for sale in my store. I appreciate your business! At the heart of the Reference 75 SE is decades of proven Audio Research vacuum tube technology, a legacy unrivaled by any other manufacturer of tube electronics. Developed through hundreds of hours of critical listening, the carefully selected components comprising the Reference 75 SE combine to provide an amplifier which transcends traditional hi-fi, instead relaying music with realism and tangibility. For sale is a vintage Lafayette KT92 tube audio amplifier. Tubes included and in nice condition. Has a Telefunken 12AX7 installed. Sold as is. HiFi Art-Elfidelity. Headphone Amplifier. Hi-Fi Tube Amplifier. Integrated Amplifier. Digital Amplifier. Audio HiFi & DIY. AV Tube Integrated Amplifier. Aluminum Chassis/DIY Enclosure. High quality extruded aluminum and wood chassis. This is a very solid chassis which can carry heavy components with no sagging. Standard wood is Brazilian Cherry. These chassis are hand built and are made in the USA. "In my full month of listening to the Rogue, I discovered the wisdom of its design. We specialize in well-cared for, previously used gear because that is what we are passionate about. We feel that there is nothing more fulfilling than creating a high-performance system on a budget with carefully selected used components, speakers and cables. Douk Audio EL34 Class A Tube Amplifier Kit (A Full Set). This product designed by Douk Audio and Boyuu is a full set pure vacuum tube amplifier DIY Kit, which need you assembled it by yourself and it's very suitable for love DIY audiophile. Musical tastes, unlike EH tubes so straightforward, undulating rhythm of music and especially good, sound field positioning is very good. Power amplifier tube: ----- EL34-B. Rectifier with a new rectifier 5Z4PJ tube, gall rectifier can slow the current impact, especially when choosed the large filter capacitance can effectively avoid indirectly heated cathode tube aging. 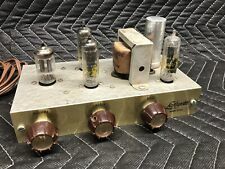 6J1 6P1 tube amplifier. 1 Piece Desktop Power Amplifier. - The tube amplifier user instruction. - Interface Input：RCA, PHONO(MM). - Power Output：2.5W 2.5W.